Gave the Flitter-B to my friend Tucker in trade for replacement equipment that's installed in it. He'll get much more use out of the Flitter than I will at this point. Here is my Flitter-B built pure-stock out of the bag from the kit parts per the directions using all the kit parts including the provided covering. Weight is: 117g/4.1oz empty and 176g/6.2oz AUP with 7-cell 280mAh NiMh pack. Powerplant is reccomended GWS-A with stock 10x4.7 prop but after the experiences with my Tiny I expect I'll quickly move to a 9x7 prop. Maiden flight awaiting cooperation from the weather. Sorry about the bad close-up photos. I'll get clearer ones taken as soon as I can take them in daylight. My macro on my digital camera really prefers sunlight to electric light. No indication on the plans of starting elevon angle so I guessed a little low, no mishaps but trimming was fun. Ended up with 1/2" up elevon for level flight. Initial throws were 1" up and down set at 25% dual rate for the reccomended 1/2" throws. 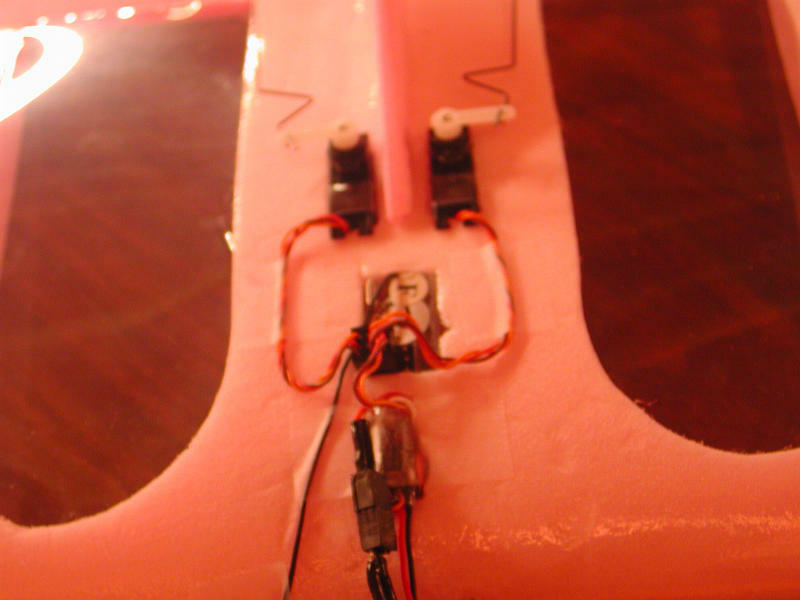 Final comfortable flying trim was 35% dual rate for 5/8" throws. With GWS-A and 10x4.7 prop it flies fine. I haven't tried the 9x7 prop yet, but I plan to. Loops from level flight just make it on a fresh battery. Full rolls are not safe at less than 75 feet altitude as you lose a lot of altitude in a roll, even with down elevator at the appropriate time. Turns are nice and sharp and she flies pretty stable even in a 5mph wind (hovering). It will fly inverted, with about 90% down elevator(elevon), but my throws are set up at only 5/8" and you can go much more if you're a good flier. She would just barely climb with full down inverted. 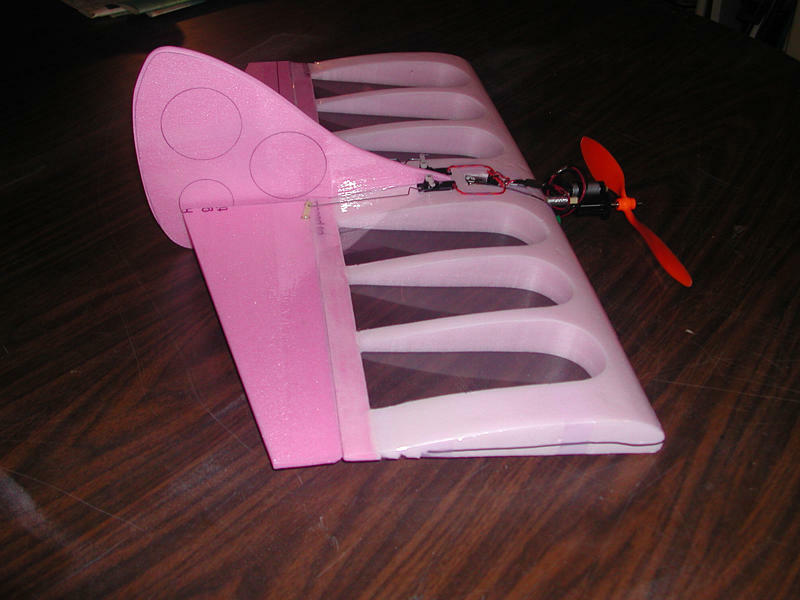 Inverted flight may even be a tad easier than the tiny because of the slower roll rate. I plan to increase the elevator (elevon function)authority another 5-10% and that should make inverted flying a joy. 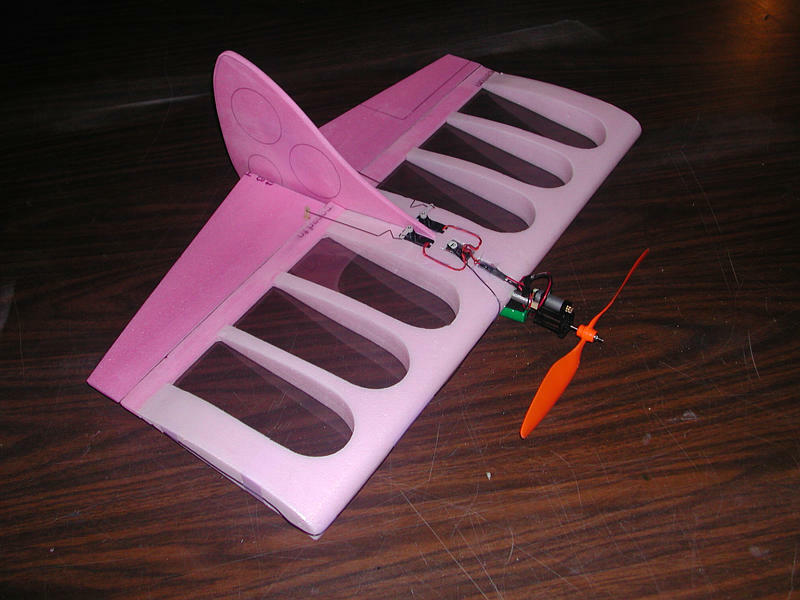 All in all it's not better at anything (except possibly flying inverted) as the tiny and in most cases a little worse, but dang, it's cheaper and builds in 2 hours flat - and that's while listening to the ballgame! I had mine finished by the 7th inning stretch! The only complaint is it's glide is a little steep, and with that big prop in the front I'm afraid eventually I'm going to break something landing. Also with the steep glide hand-catching is not that easy. With the Tiny I can hand catch easilly. Both of these could be helped by one of Nyblimp's folding props, although a $12 prop on a $35 plane might be a little bit of overkill. Possibly one of those O-ring prop mounts would help. The covering they ship with the kit is EXCELLENT. Super 77 sticks it on well, and with low heat and a sock on the iron it shrinks and seats on the foam easilly and looks good. I don't know what this stuff is, but I want to find out so I can get more for other parkfliers! It doesn't seem like it's mylar. It's a little heavier than mylar, about the same weight as Renolds Wrap only more durable and easier to work with (no clinging). 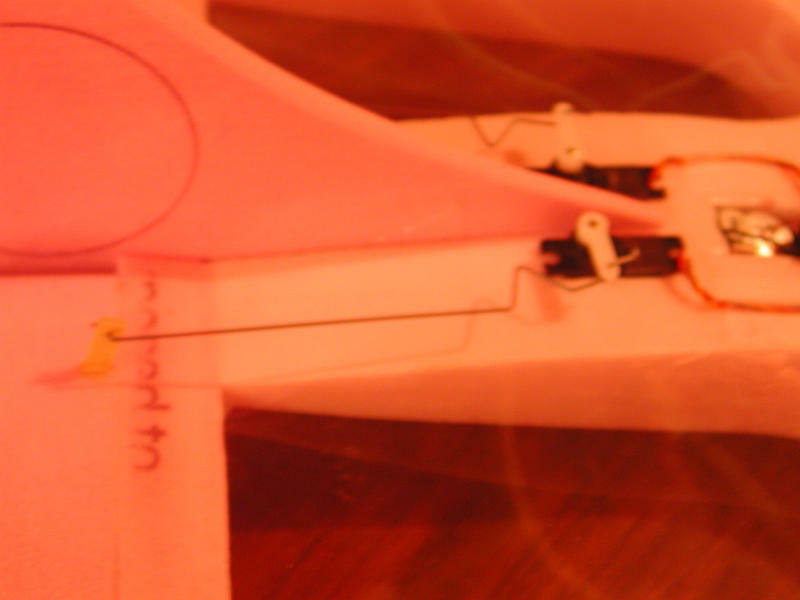 Be careful assembling the kit - don't assume the the center of the area between the innermost cutouts is the plane's centerline. Measure from the wingtips. My cutouts were 3/8" off center. No big deal if you catch it before you start building (which I did). My off-center cutouts doesn't seem to effect the performance. In summary, money well spent. There's a place in my stable for the Flitter-B, although it's primary role will be a back-up for my tiny when the tiny is unavailable. If you're looking for a cheaper, quicker to build plane than the tiny and don't mind sacrificing a little performance - it's the plane for you. A good stepping stone up from the litestik for those not wishing to build a stick-built plane like the Tiny. Covering started to peel off after much use and abuse. Re-applied a good coating of Super-77 and it's off to the races again. 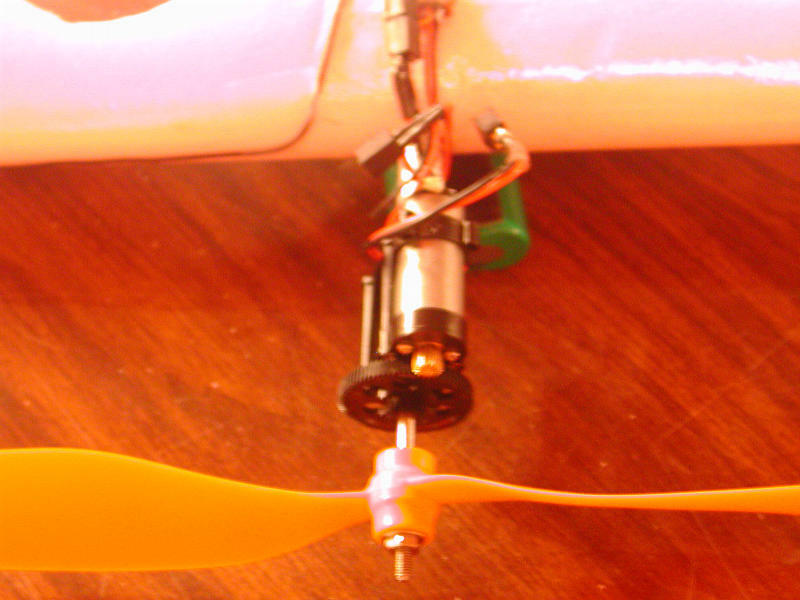 Flitter now sports the Dymond 3 bladed parkflier prop and is a much more spirited flyer with this prop on the GWS-A powerplant.